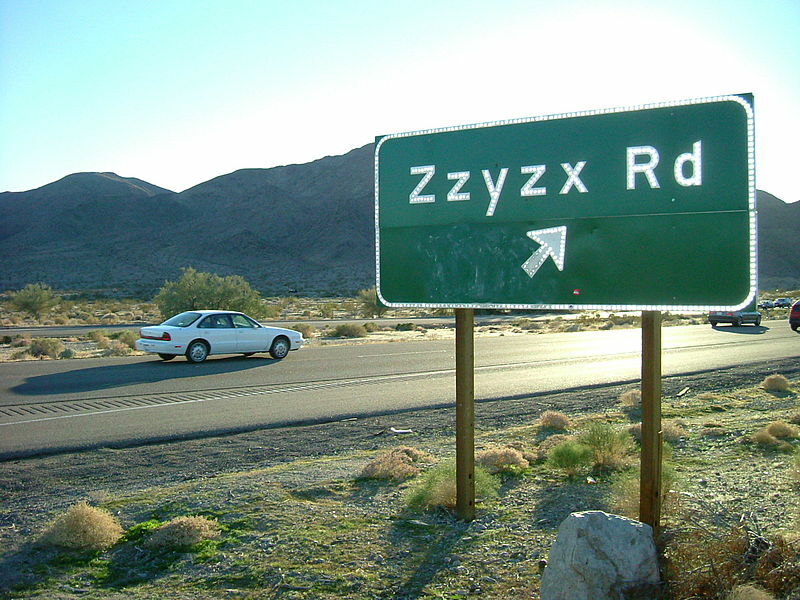 Off Interstate 15 in San Bernadino County, California, is a 4.5 mile long rural road known as Zzyzx Road. I have never seen it, heard of it, or to my knowledge, ever been near it. This item on Boing Boing, however, provided such an interesting story, and one with its origins in the Swing Era, that it merited posting. Curtis Howe Springer was one of those old-timey radio evangelists, way back in the day. However, he wasn't actually a minister of any kind. He was born in 1896 in Birmingham, Alabama, and spent much of his early life convincing people he was a doctor. . . . Throughout his life Curtis also claimed to be a boxing teacher in the U.S. Army, the "Dean of Greer College" (a defunct/bankrupt school in Chicago), he was a rabble-rouser during Prohibition (he was in favor of it, and railed against "Demon Rum"). He also loved making up universities. Like "National Academy, The Springer School of Humanism, the American College of Doctors and Surgeons, the Westlake West Virginia College, and two non-existent osteopathy schools in Meyersdale, Pennsylvania and New Jersey. . . ."
Curtis founded several health spas during the 1930s and 1940s. . . . However, Curtis really hated paying taxes, so most of his "spas" were seized by the Feds. Then in 1944, Curtis hooked up with a new lady and she filed a claim to 12,800 acres of Mojave Desert in California. Springer named the land Zzyzx Mineral Springs resort. The purpose was so that it would be known as "the last word in health," and to build his resort he hired a bunch of homeless men from L.A.'s infamous Skid Row. Springer even faked the hot spring! Seriously! He used a boiler to heat pools around the resort, which ultimately included a 60-room hotel, spa, mineral baths, a radio studio, and a church, of course. So, even though he wasn't a minister or a doctor, over 200 radio stations carried his program. Listeners would send in donations for his "cures", which he claimed could relieve constipation, hemorrhoids, hair loss and, oh yeah, cancer. However, what people were getting was, well, actually a bit better than snake oil. It was mostly celery, carrot and parsley juices.